From left are Pro Lawn-Plus/All Seasons Pest Control’s Dustin Headlee, Hubert Mahon, Marc Smith, Joanne Navarra, John Battisti, Charlie McCall, Brett Bell and Leonard Jones. Jacksonville, Fla.-based Bug Out Service, a brand of Environmental Pest Service, has acquired Jacksonville-based Pro Lawn-Plus/All Seasons Pest Control. The merger expands Bug Out’s presence in this market and adds more than $1 million in annual revenue and 3,600 customers. Terms of the deal were not disclosed. 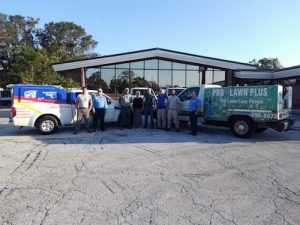 Pro Lawn-Plus/All Seasons Pest Control has been operating in the Jacksonville market for more than 30 years offering lawn and shrub care, pest management and termite control services. Seven employees will join the Bug Out team.